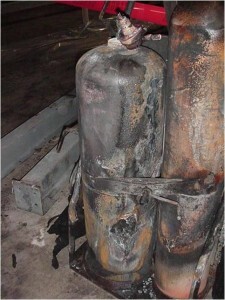 Compressed gas cylinders pose an ever-present threat to workers who use them. 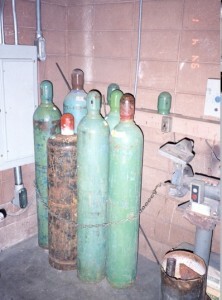 Dangers associated with damage to cylinders containing compresse d gases include oxygen displacement, fires, explosions, and toxin exposures, as well as the physical hazards associated with high pressure systems. Special storage, use, and handling precautions are necessary in order to control these hazards. Compressed gas and equipment safety measures are addressed with specific standards for particular environments including the general industry, shipyard employment, marine terminals, and the construction industry. Each compressed gas cylinder is a sleeping giant which must be used, maintained, and handled with great care. Some of the most noteworthy recommendations and regulations are described below. Never identify contents by container color, except in the case of medical gases, as color codes are not standardized throughout the compressed gas industry. The contents of a cylinder should be identified by a decal, label, tag, or stenciling. 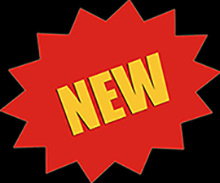 If an identifying label is missing or illegible, return the container to the supplier, unused. Industrial gas containers are fitted with outlet connections that are compliant with Compressed Gas Association’s standards for Compressed Gas Cylinder Valve Outlet and Inlet Connections. These fittings are specifically designed to prevent the connection of a gas container to a gas system with an incompatible gas. Never bypass this protection measure by using an adapter! Always use a pressure-reducing regulator that has been properly conditioned for the gas being used. Never attempt to transfer gas from one cylinder to another, or mix multiple gases in one cylinder. Do not misuse gas cylinders by using them for rollers, blocks, striking arcs, etc. Do not attempt to lift a gas cylinder by the valve protection cap. Always use a hand-truck specifically designed for the job when moving large cylinders. Be sure to secure cylinders when storing or transporting to prevent tipping over, which may lead to damage of the valve or cylinder itself, resulting in a leak or even explosion. Never move or store compressed gases in a closed van or automobile. 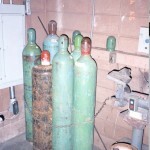 State and local building and fire codes will apply to the installation and storage of compressed gases. The following information covers some of the major requirements for the storage of compressed gases. Store all cylinders in designated areas that are secured. Flammable, Toxic and Oxygen (or any Oxidizer) gas cylinders must be separated from each other by at least 20 feet, or by a non-combustible barrier at least 5 feet high with a fire resistance rating of at least one-half hour. Inert gases such as Argon, Nitrogen, Helium, and Carbon Dioxide may be used within the separation distance since they are chemically inert and compatible with all other gases. Outdoor storage must be kept clear of dry vegetation and combustible materials for a distance of at least 15 feet. Cylinders stored outside may not be placed on the ground (soil) or any other surfaces where water can accumulate and cause rust, which may weaken or damage the cylinder, causing a leak or explosion. Storage areas must be provided with physical protection from vehicle damage. Do not store cylinders near elevators, truck loading platforms, gangways, under operating cranes, or other areas where they might be damaged by falling objects. Never expose cylinders to temperatures exceeding 125F. Smoking and open flames are not permitted in Oxygen and Flammable gas storage areas or within 20 feet of these areas. Always observe local code limits set for the storage of flammable gases in buildings. It is the responsibility of the employer to be certain that all employees using a gas are familiar with its specific properties and are properly trained to handle that gas. Proper labeling, handling and storage of compressed gas cylinders are imperative in order to prevent personal and property damage and to ensure overall workforce safety!